Boston Medical Center was founded in 1996 through the merger of Boston City Hospital and Boston University Medical Center Hospital. Boston City was one of the oldest municipal hospitals in the country and BMC continues to serve some of the most vulnerable people in the city. Chapels were present at Boston City Hospital in different ways. In 1950 the George Howard Monks Memorial Chapel was dedicated, designed by the architect Albert M. Kreider. Monks was a former chief of surgery at the hospital known for being a physician, friend and teacher at the hospital, and the chapel was intended for members of Protestant and Greek Orthodox faiths. Materials from the dedication suggest that in addition to being open daily, chaplains planned to hold Sunday morning services and week-day organ recitals in the chapel. There was also a synagogue, the Beth Isaac Memorial Chapel, at the hospital in the early 1950s constructed in memory of Rabbi Isaac & Rebecca Grossman. And historical photos suggest there was a mortuary chapel at the hospital before this time. At present, one chapel is a temporary location while a new one is being constructed. 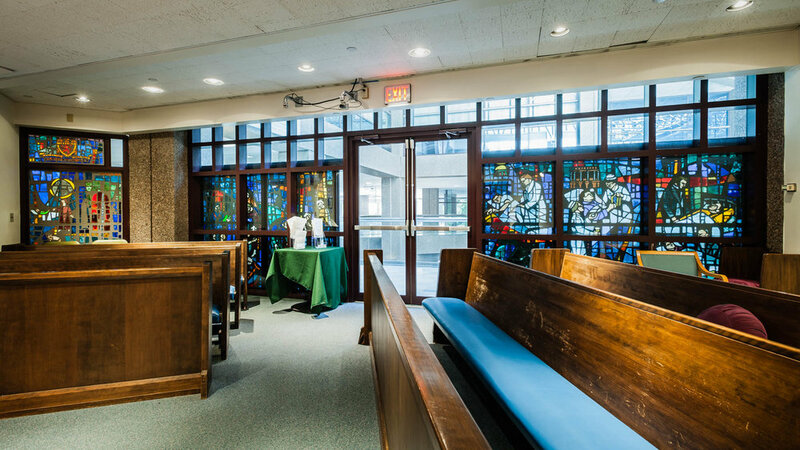 The second is more established with large stained glass windows, pews, and a regular schedule of services.